Revenue is one of the most significant metrics that you can collect using AppsFlyer. Revenue can help you mark successful campaigns or otherwise. 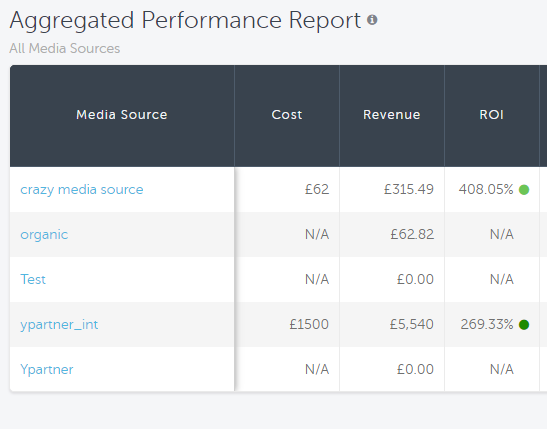 AppsFlyer lets you see revenue data per event and media source. 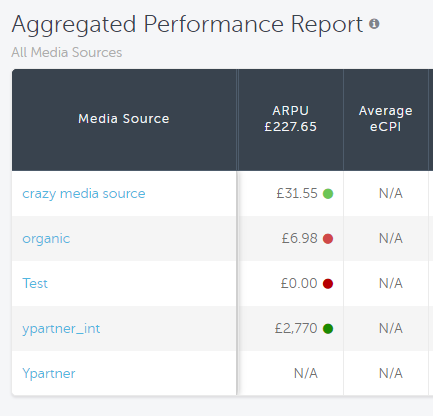 It also automatically calculates KPIs such as ROI and ARPU so that you don't have to. Another strong usage of revenue data is defining audiences for retargeting and lookalike based campaigns. This article discusses revenue in high-level perspective. 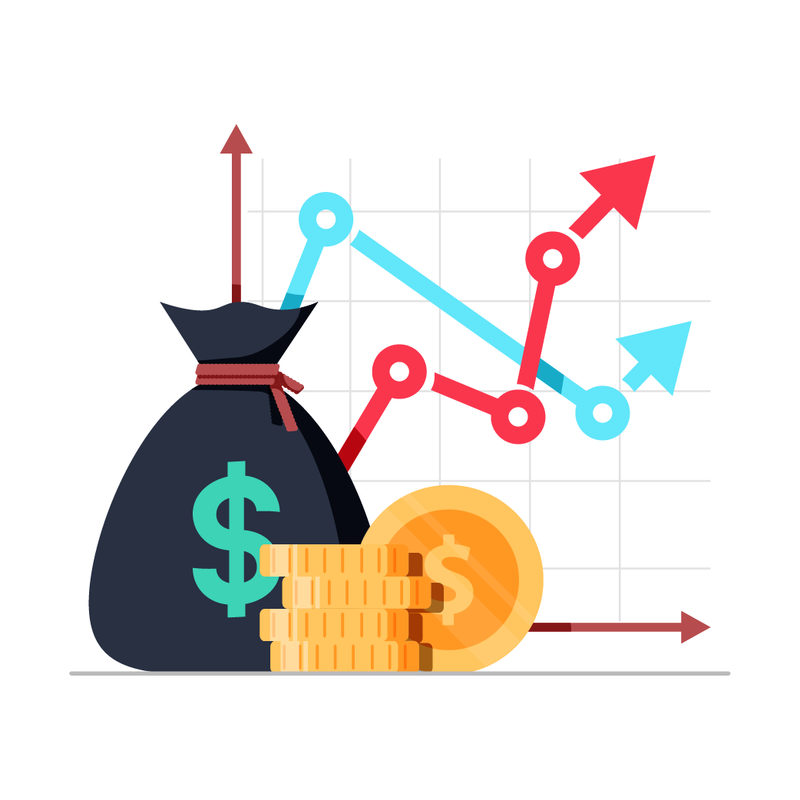 It outlines possible revenue sources, how revenue analysis can boost your marketing, and other important technical aspects of revenue attribution. There are three main sources for generating revenue. Your app can offer in-app purchases. In-app purchases are not limited to actual products that you sell. They can also include selling tickets or booking flights and hotels. Basically, any action that involves purchasing products or services is an in-app purchase. For more information on tracking in-app purchases, we recommend reviewing our guide on tracking Rich In-App Events. Many apps, such as streaming and content apps, offer paid subscriptions. Subscriptions may be monthly, quarterly or yearly but the most important thing is that they generate revenue. Subscriptions may be considered as purchases (as in purchasing a service), however the logic for tracking subscription revenue is different. For more information, you can review our Subscription Tracking Guide. Another great way to generate revenue is by hosting ads on your app. For example, your app can display ads of other apps. If your users click on these ads, you generate revenue for each click. For more information, see our Ad Revenue Tracking Guide. You run campaigns with the help of ad networks and some networks generate installs. As time goes by, some users purchase products and services using your app. 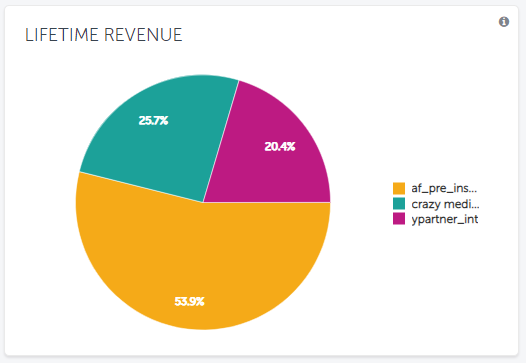 When they do so, and you track the revenue from these purchases, AppsFlyer knows which user comes from which network and attributes revenue accordingly. When you view your app's dashboard or when you generate raw data reports for in-app events, it's easy for you to see how much revenue is attributed to each network. Following the same logic, AppsFlyer also knows which campaigns generate installs. When users purchase products or services using your app, AppsFlyer knows what campaigns to attribute revenue to. You can then see which campaigns are successful and which are not. Data is displayed according to date range filter. There are several pages in the dashboard that offer revenue data visualization. The activity page contains an Activity Summary table where you can see Activity Revenue and ARPDAU (active revenue per daily active user) per media source. The events page shows the Events Drill Down table. You can see the accumulated revenue for each event per media source. You can also group by Event. af_revenue is the only parameter that accumulates your users' revenue. Always use it with in-app events that represent actual revenue generation in your business logic. af_revenue can also bear negative revenue values if you need to track events such as cancelled transactions or refunds. AppsFlyer displays the exact revenue as sent from the SDK. It does not include any calculations for VAT or app store commissions etc, unless these were included by the developer on the SDK side prior to it being sent to AppsFlyer. af_currency represents the currency that is stated in af_revenue (or af_price). If af_currency is missing from the event's parameters AppsFlyer sends it with the default value "USD". You can use af_price as a monetary parameter that is not counted as revenue (such as in an “Add to Cart” event). This parameter refers to the individual item price. The total amount of all purchases appears under the af_revenue parameter. Revenue tracking and attribution in AppsFlyer bears some technical aspects. Do NOT format the revenue value in any way. It should not contain comma separators, currency, special characters, or text. A revenue value should be similar to 1234.56, for example. AppsFlyer provides revenue value with precision of up to five decimal places. You can share revenue data with Ad networks. To do so, you need to share revenue from in-app events with the ad network. You can also grant the ad network permission to configure revenue sharing by themselves. Make sure to enable revenue sharing only for events that have af_revenue defined in their event value. Otherwise, ad networks get events with empty revenue value. It is recommended to share revenue if you want ad networks to optimize your campaigns and improve campaign results. However, sharing revenue is not mandatory. It's important to understand how AppsFlyer handles currency settings and currency conversion. AppsFlyer handles the difference between app settings currency and in-app events currency using currency conversion. AppsFlyer uses Open Exchange Rates for currency conversion. The exchange rate is updated on an hourly basis. Whenever AppsFlyer performs currency conversion, it uses the exchange rate of the last hourly update. In this case, AppsFlyer converts revenue from EUR to USD and then to GBP. Let's assume the exchange rate is €1 = $1.13. So €200 becomes $226.85. Next, AppsFlyer converts from USD to GBP. Let's assume the exchange rate is $1 = £0.78. So $226.85 becomes £176.92. Currency is set in the app settings. The currency that you set in app settings, is the currency that appears in the dashboard. No matter what currency you send in in-app events, the revenue in the dashboard always appears in the currency that you set in app settings. Let's say that you send in-app events with different currencies than the one in app settings, or with no currency at all. In this example, currency in app settings is set to GBP. You send three in-app events to AppsFlyer. The revenue that appears in the dashboard is the converted value from the in-app event currency to USD and then to the app settings currency. C 1 1 £132.9 - defaults to USD as no currency is specified. Converted from USD to GBP directly. If you set the currency to GBP in app settings but send in-app events with different currencies, the raw data report shows revenue in both app settings currency and in-app event currency. If you set the currency to GBP in app settings but send in-app events without currency, the raw data report shows revenue in both app settings currency and in USD. C 171 USD 132.9 defaults to USD as no currency is specified. Converted from USD to GBP directly.